Vanderhall Motor Works unveiled its compact three-wheeled electric roadster at the 2017 progressive International Motorcycle show in Long Beach, California. An electric vehicle dubbed the Edison2; it joins the Ohio based company’s retro-styled 'Venice' roadster. Vanderhall, based in Provo, Utah, founded in 2010 by Stephen Hall, created a hand-built three-wheeled gas car called Laguna back in 2012. Its mission is to bring back the passion of roadster motoring with exotic textiles, carbon fibre/monoaluminum chassis, and performance to match its looks. Today it has three current models, the Laguna, Laguna Sports Premium, and the Laguna Bespoke Motoring Experience. And now the Edison2 has joined the ranks. 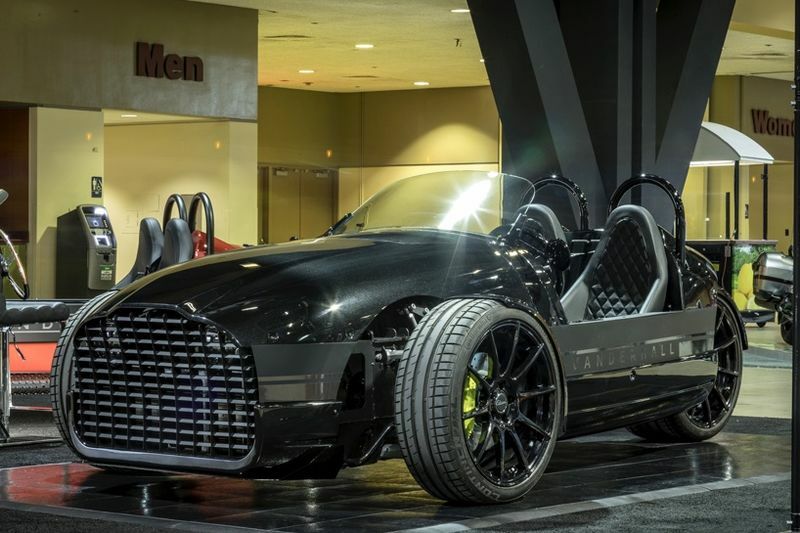 Vanderhall paints the Edison2 as a tribute to the Thomas Edison and Henry Ford electric car project more than 100 years ago; by painting it any colour the customer wants — so long as it is black. The electric model replaces the 1.4-litre turbocharged GM four-cylinder engine, with a dual AC motors and a 30 kWh lithium-ion battery pack. Acceleration is instantaneous from the immediately available torque driving the front wheels. This propels the roadster from 0-60 mph in four seconds and, depending on driving conditions, the range can exceed 200 miles (322 km) per full charge. The hand-built Edison2 has 180hp and 240 lb. ft. of torque with its dual AC electric motors. It sprints from 0–60 in just 4.0 seconds and is stopped again by its standard Brembo brakes in less than 85 feet, while its top speed is 105 mph. It has a 30 kWh lithium-ion battery pack and weighs 1,400 lb. (635 kg) for an estimated range of 200 miles. One thing we found out that surprised is that it has an electric steering system, which – considering the relatively low weight of the car – made us wonder why. Guess we'll have to find out. You can see the Edison2 in the image gallery above.